I have a very good (I assume) point and shoot high end camera with me. Model is Panasonic Fz35. I think it has very nice features and using the camera in manual mode is nice too. However, with all the nice in-built features in my camera, can I say it's equivalent to any base SLR camera (ignoring additional lens for SLRs)? Can I use my camera as an SLR itself? If not, what basic things are missing from my camera to any basic SLR? In short, what differentiates a high end point and shoot camera from an SLR? To be an SLR the camera has to have a mirror and optical viewfinder as cabbey states. The optical viewfinder has several advantages, namely a crisper image for easier manual focus (as you're getting the full resolving power of the lens, instead of a small LCD screen) and zero lag (as what you're seeing is happening in real time!) which can be useful for sports etc. There are a few disadvantages as well, you can't zoom an optical viewfinder, nor can you preview image settings (you can set an electronic viewfinder to show you the image in black and white for example). Whilst the viewfinder is the only difference by definition there is another important distinction which impacts shooting, and that is that digital SLRs almost always have much larger sensors than compact bridge cameras like the FZ35. A larger sensor allows you to capture much more light giving the SLR much better performance in low light. Some compacts do have SLR sized sensors (eg. Sigma DP2, Fuji x100), but they tend to have a very limited zoom range. You certainly wouldn't be able to get a 18x zoom on anything but a small sensor! The ability to produce small light zoom lenses is the reason manufacturers have stuck to small sensors. In addition to capturing more light, the larger sensor also gives you a shallower depth of field (when matching the field of view of a small sensor camera). This means the range of distances from the camera that are in focus is much smaller. This can be used to artistic effect allowing you to isolate the subject and blur out the background. The only way to get blurred backgrounds with a small sensor compact is to use a long focal length (zoom in a lot), or get really close to a small subject (using the macro or close up function). I would say shallow depth of field is the biggest difference in terms of the images, as nothing can be done to replicate the look of an SLR when producing images with shallow DoF in certain circumstances (except by faking it in Photoshop which is difficult and time consuming). When I see an image with shallow depth of field, especially if it's a moderately wide angle I can tell instantly it's from an SLR not a bridge camera. Others have pointed out that an SLR has a mirror while a P&S does not, which is true. Another important difference is the autofocus mechanism; a P&S uses contrast detection off the image captured by the image sensor, an SLR has an entirely separate set of autofocus sensors that reads part of the image reflected off the mirror. This technical detail is important because the phase-detection focus system of an SLR can focus a lens almost instantly (given that the AF motor of the lens is up to it, which is sometimes true and sometimes not) while the contast-detection system relies on a lot of trial and error and can take a LOT of time to get into focus. This makes the SLR a lot more responsive, with less lag between pressing the shutter and actually taking the picture. Basic definition: SLR means "Single Lens Reflex". It's not a quality statement, or a measurement of how good a camera is... it's a definition of how the camera works. That it has come to be thought of as a quality indication is a side effect of the fact that typically SLRs are much more complex, so they tend to be made to higher standards. There is an overlap between really high end "point and shoots" and really low end SLRs. But if your camera doesn't actually have a mirror that folds up (that's the reflex part) to deflect the light from the (single) lens into the view finder instead of shining against the shutter, then no, it's not an SLR. But from a usage perspective, that really doesn't matter... does it capture an image that is acceptable to you for the purposes of whatever artistic expression you want? If so, then use it! update after looking at the specs for that camera... yeah, I think you could use that just as you would most entry level DSLRs. It seems to have all the controls that you would need. Note that not all SLRs have interchangeable lenses. however, Matt makes a VERY good point about sensor size, an item I had forgotten to consider. Regarding features, an advanced fixed-lens camera (like yours, which is usually called a bridge camera rather than a point-and-shoot) generally covers the basic feature set found in DSLRs except for the ability to change lenses. This includes manual exposure, metering options including spot-metering, custom white-balance, continuous drive, bracketing, etc. Some such cameras (but not yours IIRC) also include connectivity for external lighting. This is usually at least a hot-shoe but sometimes a sync-port as well. This lets you use additional lighting options, on and off camera using a remote-trigger or cord. For certain types of photography, this is an indispensable asset. Note that bridge cameras often also have features not found (or very rarely found) on DSLRs too. Continuous autofocus in video-recording mode is one example, very few DSLRs can do that. Sweeping panorama is another such feature. There are plenty more. Many such features need an electronic shutter rather than a mechanical one. Most bride cameras actually have both but DSLRs almost always use mechanical shutters (except video and very rare exceptions). This lets some non-DSLRs reach a shutter-speed for 1/40000 (yes 4 zeros) which no DSLR can do. Continuous shooting up to 60 FPS is also possible without a mechanical shutter. An important difference comes from the lens. While a DSLR can do far more with all possible lenses (fisheye, tilt-shift, ultra-wide angle, bright aperture), it can rarely do more with a single lens. This has a lot of repercussions including cost, size and weight. There are other cameras than point-and-shoot and SLR. Others include medium format, rangefinder, large format, mirrorless interchangeable lens, cellphone cameras, and more. No matter what, the biggest differences between different types of camera, in terms of actual differences in image quality, will come down to two things. Size of the sensor. The sensor on a DSLR is much larger - between 5x and 36x larger - than on a compact (or "bridge" or "superzoom") camera. Even more so between a DSLR and a cellphone. This will result in greater sharpness, less noise at high ISO and therefore also better low-light performance. You also get more control over depth of field, and more. Interchangeable lens. It means you can buy a better lens if you want, and buy lenses that work better in certain situations. You're not stuck with one zoom lens, which tries to be do everything and as a result is not as specialised at any one thing. There's nothing that technically differentiates between the two except the way the user operates the camera. If you use a $10.000 SLR on full auto mode so you never do more than point and shoot, you're using it as a point and shoot camera. If you have a decent compact with options for manual control and use those, it's not a point and shoot camera for you. IOW: point and shoot isn't a type of camera, it's a style of using cameras. SLR otoh is a type of camera, a camera with a single lens assembly and a moving mirror to direct light coming through that assembly either to the viewfinder or to the film plane (nowadays, sensor plane). Not the answer you're looking for? Browse other questions tagged point-and-shoot slr or ask your own question. What makes a camera an “SLR”? 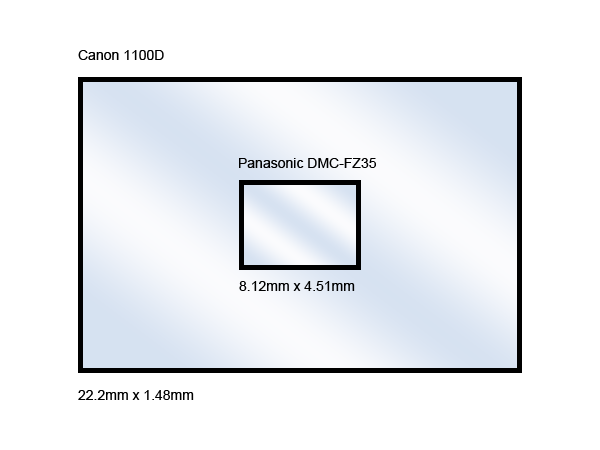 When Peterson says 'fixed-lens digital cameras have greater DoF', is he assuming a smaller sensor? Is it normal for live view to freeze when focusing with a point & shoot camera?